We got a new digital camera and my review writing is going really slowly, so here are some of pictures of recent book acquisitions (for those who like that sort of thing). These are some of the books I got for Christmas. On the left is The Charmed Sphere, the first book in Catherine Asaro’s fantasy series, Misted Cliffs. I got this one from a friend who is also a big fan of Asaro’s Skolian saga. We’ve both been wondering how her other series is, so she sent the first one to me. 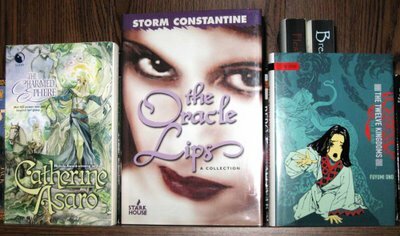 In the middle is The Oracle Lips, a short story collection by Storm Constantine, one of my favorite authors for her Wraeththu series. Since this one is a numbered, signed book, I was excited about it and it’s my favorite Christmas gift. The one of the right is Sea of Wind, the second book in the Twelve Kingdoms series by Fuyumi Ono. One of the few anime series I really liked was based on these books and I enjoyed the first novel. Here are some of the recent review copies. 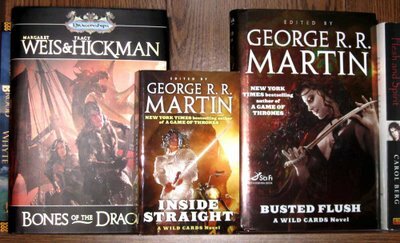 From left to right: Bones of the Dragon (Dragonships of Vindras #1) by Margaret Weis and Tracy Hickman, Inside Straight edited by George R. R. Martin, and Busted Flush edited by George R. R. Martin. I’ve never read any of the Dragonlance novels, or anything by Weis and Hickman. My plan is to read Inside Straight after I read my “required read” for this month. I’ve wanted to read a Wild Cards novel for a while and it has superheroes, George R.R. Martin and various other authors I’m curious about (i.e., Daniel Abraham and Carrie Vaughn).